Progress has been a bit slow on the ramp, mainly due to the heat and being off work with the kids on school holidays. But it is coming along and should mostly be done before I’m back at work on Thursday. 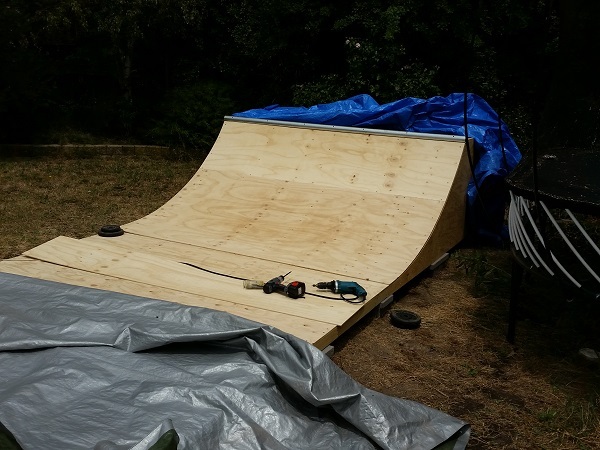 Getting the two layers of plywood onto the ramp was the next step in the project. Using 9mm thick ply, I began adding sheets of 2400×1200 at each end until they met in the middle. At that point a small piece was cut to fill in the gap that remained. With the first layer done, it was time to begin on the second layer. If I do this again, I won’t add sheets on both ends and simply work from left to right on the first layer and then right to left on the second layer to make things easier. The key thing is to ensure the seams are not at the same points on each layer.